Can't make it to any SLAMs (Samanage Local Advocacy Meetings) in the Spring? 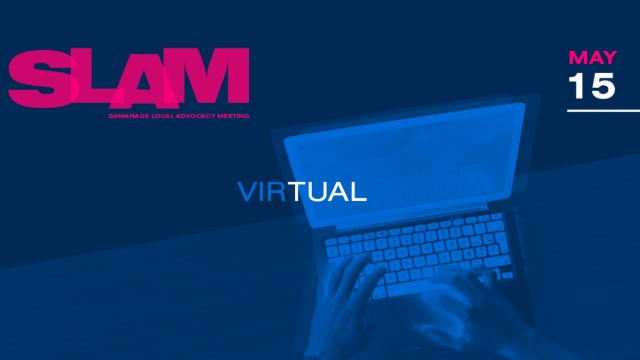 Sign up for our free virtual session to hear a customer use case and the most up to date Samanage product and functionality news. You may not always notice artificial intelligence in the products you use, but you should notice a better, more intuitive experience. As AI trickles into the service desk, it’s important to keep that goal in mind: provide value to the employee through a better experience. You'll also see a demonstration of how AI drives a more efficient service experience in the Samanage Service Platform. Join us to start transforming the service experience for your employees! - How to work "on the schedule of the business"
Samanage customer, DPR Construction, will share how they have pushed the boundaries of service management. They'll present how they’re providing the highest level of service to their employees using the Samanage Service Platform. IT leaders are experts in service management. From ITIL best practices, to building workflows, to measuring service delivery, IT has it down to a science. But the employee experience reaches far beyond IT. This webinar will show you how IT can take a leadership role in helping other departments deliver the same quality services to employees throughout the organization. Shvonne Craig, Director of IT Services at EXOS, will explain how she helped create a single platform for employee support by including all of the major stakeholders. Organizations are looking to access services in a completely different way. In the past, technology leaders have had to deal with multiple softwares or solutions for individual lines of business, now they have the opportunity to take all of the services within an organization and measure them through one service platform. In this panel discussion, we’ll go through the tenants of customer service and how those are now applied through IT service management best practices to make this the era of employee services. In today’s organization, every department is a service provider. Modern service management strategy has drastically improved IT services, but employees need more than that. Accreditation Commission for Health Care (ACHC), actually introduced a service catalog and ticketing strategy through its marketing department. It was such a success that multiple departments followed suit. Learn how they strategized, implemented, and measured results throughout their organization! In this webinar, we’ll show you how adoption of your self-service portal can improve both CSAT and service desk efficiency, as well as increase collaboration across the organization. We’ll also introduce you to First Health of the Carolinas, as they share how they creatively pushed portal adoption throughout their large organization, turning thousands of potential help desk phone calls into thousands of quickly-resolved tickets. The new GDPR guidelines have brought us to a new level of oversight for dealing with data privacy. What data privacy means to Samanage. How Samanage approached GDPR compliance within the ITSM space. How Samanage will be operationalizing privacy management post May 25 2018. Best practice methods for Samanage and our customers to work together to maintain compliance. In this webinar, Samanage will give you a toolkit that will enable you to apply the 5 must-do ITSM best practices to every department in your organization – all while increasing employee satisfaction and driving positive business results. 1. ITIL - How can other departments benefit from incorporating elements of the ITIL framework that promote continuous improvements to best streamline service delivery? 2. Knowledge Base - What if your organization had a comprehensive database of articles, resources, and resolutions available for all employees to easily access no matter what department they were submitting a request to? 3. Self-Service - How about if you had a single portal where employees can submit an IT ticket, facilities ticket, or even a catering request for an event? 4. Automations - From SLA breach alerts to new hire onboarding requests, wouldn’t it be nice if you could eliminate redundant tasks, set up alerts, and more? 5. Service Catalog - How can a robust service catalog streamline everyday workflows across departments, like a request for marketing to update the company website? IT departments have a lot to keep track of. Employees throughout the organization use assets, request licenses, change roles, and add business tools. They come and go in a steady stream. Luckily, the right tools and integrations can simplify these processes so your service desk can fluidly handle these transitions. Building a strong foundation is a great way to begin any endeavor - change management is no different. Earlier this year, we covered change management according to ITIL. Now, we take a step back to cover change management from a less technical perspective. Join Britt Layman, Customer Success Manager at Samanage, on Wednesday, September 27 at 2pm EST, as he walks you through the process of determining use cases and setting up change management. Even in this time of ever-changing technology, artificial intelligence and machine learning seem a long way away from trickling down to day-to-day life. But the time for automation and AI for the service desk. Join Nathan Riley, Sales Director at Samanage, on Thursday, September 14 at 2pm EST, as he discusses the swift rise of automated processes in the service desk, and how machine learning is already infiltrating ITSM. IT organizations are being asked to cut costs while increasing productivity and identifying new ways to generate revenue. The first step in delivering value to an organization is empowering IT with the gift of sight. Sure, you can measure just about anything, but should you? More metrics does not equal better metrics. Not tracking trends over time, not setting goals, and not sharing metrics reports are common mistakes. The right metrics, tracked consistently, allow you identify areas for improvement and act on them. Join us as we discuss how an effective IT service management solution, coupled with the right metrics on your radar, can bring a new level of efficiency to IT. Metrics we’ll focus on: Cost Per Ticket, Customer Satisfaction, Agent Utilization, First Touch Resolution, and Mean Time to Resolve. Why is the service catalog still so mysterious to IT organizations big and small? It’s built into IT service management solutions, but is one of the features that regularly goes underutilized. Not only are the use cases for IT mind-blowing, but the perks that come with it can change processes for the better and drive success across an organization. Once IT recognizes the value of the service catalog, the opportunities are endless across the enterprise. Registrants will receive an ITIL Process Framework poster that details out the individual process workflows within ITIL. Samanage is unlocking the true potential of service management by streamlining business service requests and delivery processes across any organization through their cloud-based service management platform.